The new API 692 Standard for Dry Gas Sealing Systems is coming soon, and the experts at Lube-Power, Inc. are ready. As you know, dry gas seals have revolutionized API class turbo-machinery sealing technology, and they offer many benefits. Yet, to ensure reliable operation of dry gas sealing systems, you need the right support system. Otherwise, with an inadequately designed support system, dry gas seals often fail, resulting in down-time and outages. We also educate our clients on the importance of regularly monitoring gas streams to verify that gas seals are functioning properly. 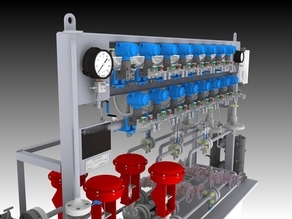 We’re confident that our gas seal support systems are the best on the market. And, at Lube Power, we’re dedicated to offering superior customer support as well. We’re here to help you through the API 692 updates and to give you a head-start on the upcoming changes to API 614. We’re the premier lubrications systems company because we’re passionate about 1) the quality of our work and 2) forming positive and long-lasting relationships with our clients. If you have questions about any of our products or the new editions of API 692 or API 614, please give us a call at (586) 247-6500 or reach out to us through the contact form on our website. We proudly serve clients in the following industries: Petro-Chemical, Power Generation, Pipelines, Steel, Cement, Pulp & Paper, Food and Automotive. And throughout the years, we’ve worked with some of the most renowned companies in the world. We look forward to serving your needs next and earning the opportunity to exceed your expectations.